Read pricing, features, and a review for the Lorex 4K (8MP) Outdoor Metal Security Camera with Audio. The Lorex 4K (8MP) Outdoor Metal Security Camera with Audio (LBV8721AB) is an analog 4k security system from Lorex for indoor or outdoor security use. The camera is also equipped with a built-in microphone for audio recording. 87° FOV ideal for monitoring wide, open areas. Pros: Weatherproof design. Full-color night vision. Digital zoom. Cons: Image resolution is difficult to adjust. Bottomline: A reliable security camera solution that works seamlessly with a Lorex DVR. 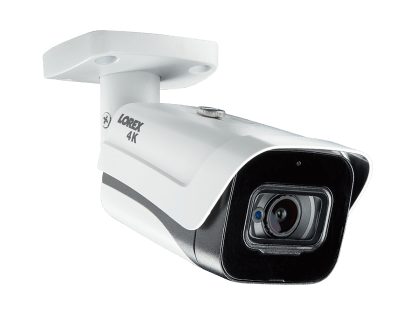 What are some Lorex 4K (8MP) Outdoor Metal Security Camera with Audio (LBV8721AB) alternatives? Where can I buy the Lorex 4K (8MP) Outdoor Metal Security Camera with Audio? The Lorex LBV8721AB is available on Amazon and on the Lorex website. Does the Lorex 4K (8MP) Outdoor Metal Security Camera with Audio work at night? Yes, the camera is equipped with night vision that can see up to 150 feet in ambient lighting and up to 100 feet in total darkness. Can the Lorex 4K (8MP) Outdoor Metal Security Camera with Audio be used in any weather? The Lorex 4K 8MP HD camera is designed for indoor or outdoor use and has a waterproof exterior. The camera can function in temperature ranging from -22°F to 140°F.